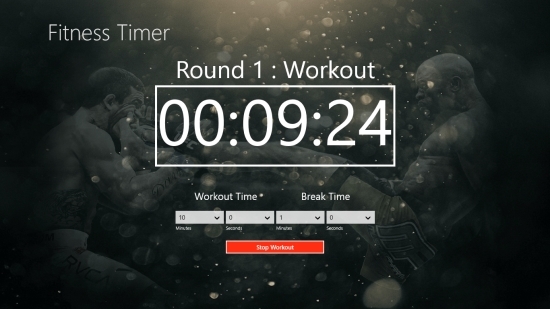 FitnessTimer is a free Windows 8 Workout Timer app to help you with your round-based workouts. 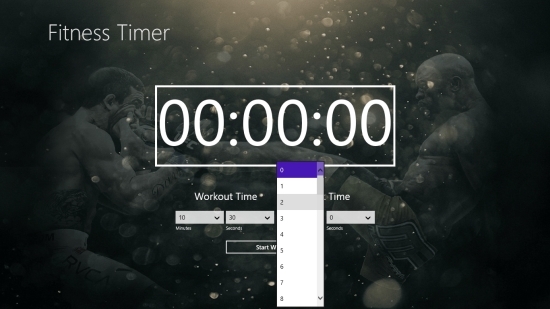 In this free Windows 8 Workout Timer app, you can set workout time, break time, and get notifications as ringing alarm after the set time intervals are reached. It is a specially designed app using which you can do rounds of exercises with specified breaks. The clock is pretty bold and offers to set minutes and seconds for workout time. The graphics are attractive too! FitnessTimer is freely available in Tools category of Windows Store. You can search for the app in Windows Store using Win+Q key combination or view it directly in Windows Store by clicking on the link given below at the end. 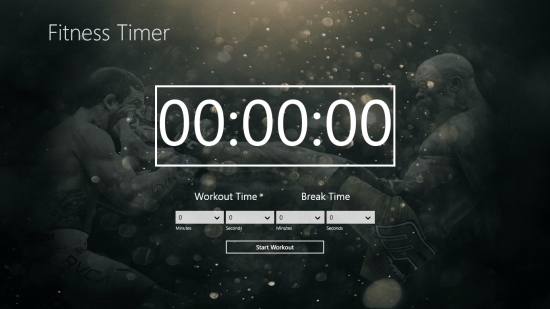 Let’s have a detailed look at this free Windows 8 Workout Timer app. FitnessTimer is quite a handy app and will be really helpful if you do workouts in your daily routine. The main screen of the app will display a bold digital timer with nice graphics in the background. The timer will display hour, minute and second time configuration. Just below this timer, you will find two options: Workout Time and Break Time. Set workout and break time using the dropdowns provided. Now, click on Start Workout button. The timer will start counting the time. As soon as the set workout time is reached, you will hear a ringing alarm. And then, the break timer will start. The color of the timer will change while counting break time. The alarm will keep notifying you after every workout and break time period. Above the timer, you can see the number of rounds you have completed. As the timer starts, Start Workout button will convert to Stop Workout button. You can click on it anytime to stop the active timer. Also try Fitness at Home and Active Fitness. FitnessTimer is a very appropriately developed app for scheduling your workouts. You can do rounds of workouts with break notifications. Therefore, no more need to keep an eye on the watch while doing workouts. Go ahead and enjoy distraction-free workouts with FitnessTimer. Share your feedback via comments.